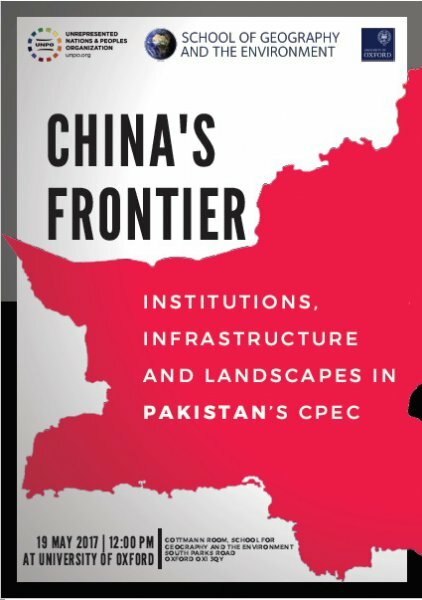 On 19 May 2017, the Unrepresented Nations and Peoples Organization (UNPO) and the University of Oxford’s School of Geography and the Environment will convene an academic conference entitled “China’s Frontier - Institutions, Infrastructure and Landscapes in Pakistan’s CPEC,” at the University of Oxford. The conference will bring together high-profile academics to discuss cross-cutting themes related to the planning and implementation of China-Pakistan Economic Corridor (CPEC). As the current centrepiece of the Chinese One Belt-One Road (OBOR) initiative, the China-Pakistan Economic Corridor consists of a $46 billon dollar initiative to upgrade and build new infrastructure, energy projects and industrial zones across the entire length of Pakistan. The new routes aim at connecting Kashgar, in Western China, through the disputed territory of Gilgit-Baltistan, to Karachi in Sindhi, and to the deep-sea port of Gwadar port, in Balochistan. Despite authorities advertising it as a project that will benefit the local population significantly, Pakistan’s campaign to implement CPEC has been controversial and widely contested by local inhabitants, especially ethnic minorities and indigenous peoples. Anything interpreted as dissent has been violently crushed by the authorities and gross human rights violations have been reported in the areas where Pakistani and Chinese military are present. This one-day conference will offer a platform for interested researchers and stakeholders around several themes. The debate will mainly focus on the question of institutions and governance; the impacts on livelihoods; how infrastructure decisions are made, managed, and implemented; climate and environmental challenges; the economics and investment aspects, from China’s and Pakistan’s perspective. The conference will be live streamed on UNPO’s Facebook page.